Patriotic decorations are perfect for ushering in the warmer weather. Summer season is always fun with sun-kissed skin and backyard barbecue. The season also brings great American patriotic holidays such as Memorial Day, 4th of July, and Labor Day. 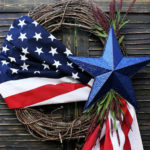 The mood-brightening season and the greatest American holidays together bring a nice occasion to make some summer wreaths for the patriotic decorations of your home or as gifts. 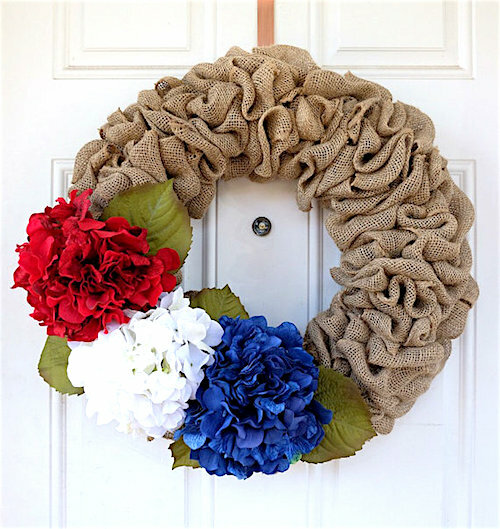 Let’s take a look how to make a burlap wreath with some nice patriotic decorations on it. This is an easy project that will help giving a patriotic spirit to your home when you are not busy planning the outdoor party or barbecue menu. 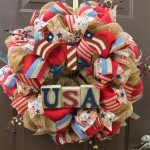 Bring the spirit of Americana to your front door this summer! Note: Use patriotic ribbon colors and glue on stars afterwards to tailor this video for patriotic holidays. 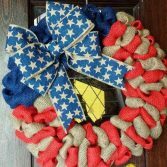 For the direct link to the patriotic burlap wreath video, click here. 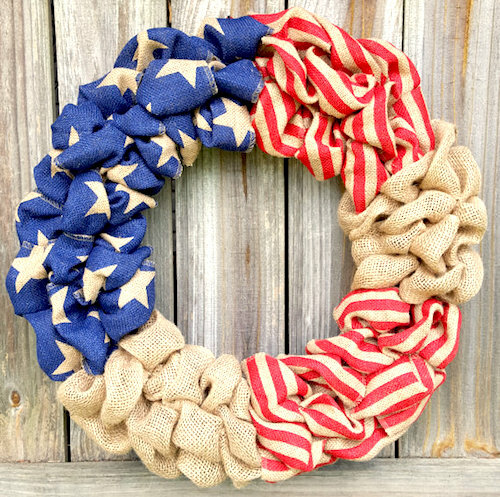 Use red burlap ribbon, blue burlap ribbon, and natural tan burlap ribbon, as it will be easier to give the wreath a patriotic touch with these colors. Take the blue burlap ribbon, fold one end in thirds, and attach it to the third bar (from inside) of the frame with a piece of floral wire. Your frame has nine sections distinctly separated by crossbars and each section has three openings – bottom, middle, and top. Start from the bottom opening and pull the blue ribbon through in a loop. Do the same for the other two openings. After making the loop through the top opening, twist the ribbon at the bottom and make another three similar loops just next to the fist ones. Now repeat it by making a loop and pulling through the bottom, middle, and then the top opening. Keep doing this process until three successive sections are weaved with the blue ribbon. Secure the last end of the ribbon to the frame with floral wire. Weave the next section of the frame with the tan burlap ribbon. After that, use red burlap for weaving the section next to it. Take turns with tan and red burlap ribbons until the entire frame is weaved. Be sure to push the loops to the side so that you can add more. It will give the wreath a fuller look. 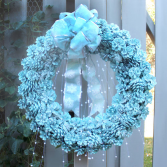 When the wreath is complete, try to fluff the loops a bit, so that the wreath looks good and full. Make sure that there is no visible floral wire. Stretch or fluff the loops to cover any such visible part. Glue the white stars to the blue part of the ribbon in a sporadic manner. Make a bow with the yellow ribbon and glue it too to the blue part. 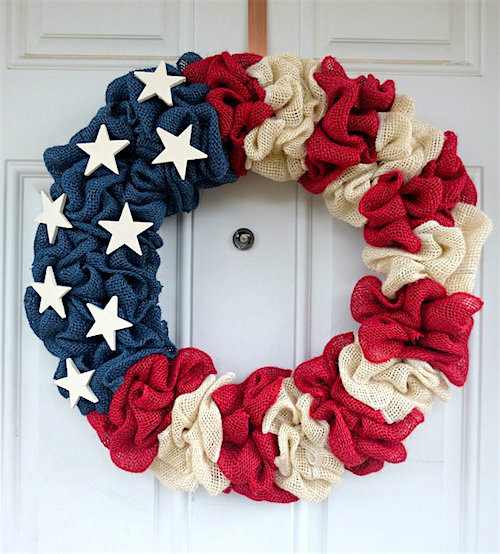 Patriotic burlap wreath with stars will welcome summer guests! 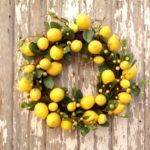 Where to Get the Wreath Making Supplies? 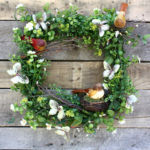 Making such summer wreaths does not need tons of supplies. You will easily get all of them at any local craft store or any e-commerce store in case if you want to order online. 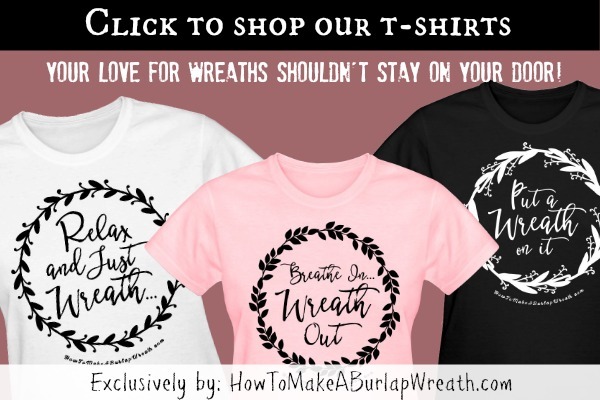 How to Make a Burlap Wreath also links to many online wreath craft supplies for your convenience. 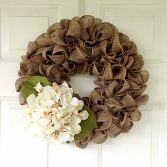 Burlap wreaths are the recent craze and they are really easy to make. The classic colors combined with the rustic feel of burlap will make perfect patriotic decorations for the Memorial Day, 4th of July, Veterans Day, and Flag Day. We hope that this patriotic burlap wreath tutorial will inspire you to create a unique patriotic wreath to hang on your front door this summer! Adorable!! I need a new wreath and this one is perfect! Thanks! This is really great! I don’t have a door worthy of a wreath, but when I do I’ll be coming here! Thanks for linking up with Welcome Home Wednesdays! Live every Wednesday at 7AM EST. Check out this easy and fun digital scrapbooking software! Sign up to get ideas and promotions to celebrate, decorate & organize your home, for FREE! 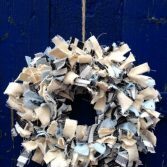 Visit How To Make A Burlap Wreath's profile on Pinterest. All the images on this site are strictly inspirational and WE DON'T CLAIM RIGHTS TO THEM. We have put source text and link backs to the original source below the images. Please contact us for any questions or comments. Ronique Gibson is a participant in the Amazon Services LLC Associates Program, an affiliate advertising program designed to provide a means for sites to earn advertising fees by advertising and linking to Amazon.com.